For every cup in our product line we have a lid to compliment your cups style. The durable lids and reusable lids offered by Gator Paper are perfect for any type of cup you serve. Our website provides information on the styles of lids and the cups they fit. Gator Paper also provides information on the lid designs and materials which make them durable and long lasting. 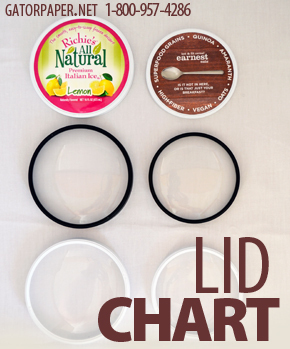 Review the lid chart for all information. Check out the different cups also available and see if you don’t need other cups styles to accompany special food offers. Our lids designs and materials are made to be durable and long lasting. We carry lids for every size cup! Gator Paper is here to help with all your food packaging and restaurant supplies to keep your business growing strong. We at Gator Paper pride ourselves on offering quality products at an affordable price. We work with our customers to fulfill specific order requirements and strive to build lasting relationships along the way. Along with cups and lids we offer paper sheets, beverage napkins, cushion foil sheets and much more.